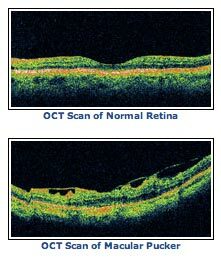 Macular puckers can be detected by a complete eye exam with your ophthalmologist. As retinal specialists, our focus is to determine how much the macular pucker is contributing to your visual symptoms and what can be done to remedy the problem. Fluorescein Angiography is a test performed in the office which can help us determine the health of the macula. Optical Coherence Tomography (OCT) is a state-of-the-art test which helps us actually visualize how much the pucker is pulling on the macula.